Although the Sun is not a planet, it is considered a “light” in astrology; and since it appears to travel around the Earth just like all the other planets, it is treated as such. However, the Sun holds prime importance (along with the Moon) in the horoscope. The Sun is the ego, purpose, a person’s vital energy. As the Moon is unconscious, the Sun is conscious. The sign and house placement of the Sun indicates how and where a native needs to express herself in order to be fufilled. The Sun is the archetype of the Hero, and our journey in life is to shine in a way that only we can. 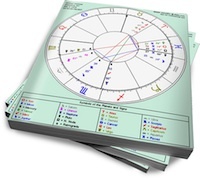 In a woman’s chart, the Sun can indicate the husband or an important man in her life.